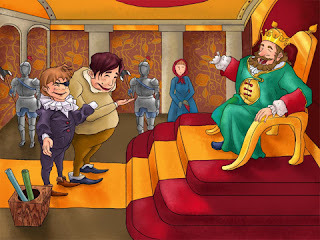 Story: The New Emperor - Something New Everyday! Ling kept checking his seed, but nothing ever grew. Three weeks, 4 weeks, 5 weeks went by. Still nothing. By now, others were talking about their plants but Ling didn't have a plant, and he felt like a failure. Six months went by–still nothing in Ling's pot. He just knew he had killed his seed. A year finally went by and all the youths of the kingdom brought their plants to the emperor for inspection. Ling told his mother that he wasn't going to take an empty pot. But honest about what happened, Ling felt sick to his stomach, but he knew his mother was right. He took his empty pot to the palace. When Ling arrived, he was amazed at the variety of plants grown by the other youths. They were beautiful–in all shapes and sizes. Ling put his empty pot on the floor and many of the other kinds laughed at him. A few felt sorry for him and just said, "Hey nice try." So be careful what you plant now, It will determine what you will reap tomorrow,The seeds you now scatter, Will make life worse or better,your life or the ones who will come after. Yes, someday, you will enjoy the fruits,Or you will pay for the choices you plant today.